Pawar Travels provides you taxi facility from Pune To Satara. The distance from Pune via Satara is 120km. 3.Hitchenia caulina . 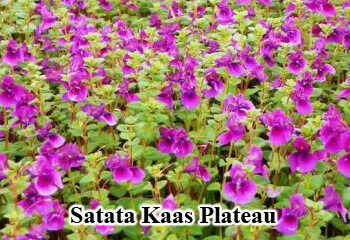 They are known as the valley of Flowers in Maharashtra. Sajjangad the fort of Good people located near the satara city is the final resting place of Saint Ramdas. Asvalayana Rishi who lived there for manny years in ancient times the fort was known by him. Later on it was named as Aswalya gad due to number of bears found there. Sajjangad is approx 18 kms away from Satara City and tourists have to climb ariund 100 steps to reach the gate of Sajjangad Fort. Comming towards the Pratapgad Fort which is well known for its Tourists Spots. Pratapdas was bulit by Shivaji Maharaj in the year of 1656. The Structure of the fort is such that it can be divided into lower fort which was built on the crest of a hill and upper fort. Thosehar Waterfall it is considered as a picnic area which is newly constructed platform which gives a graceful view of the waterfall . This waterfall is the tallest Waterfall in India , A full view of the Thoseghar waterfalls can be obtained by going to Chalkewadi, and then walking down by road for 5 km.